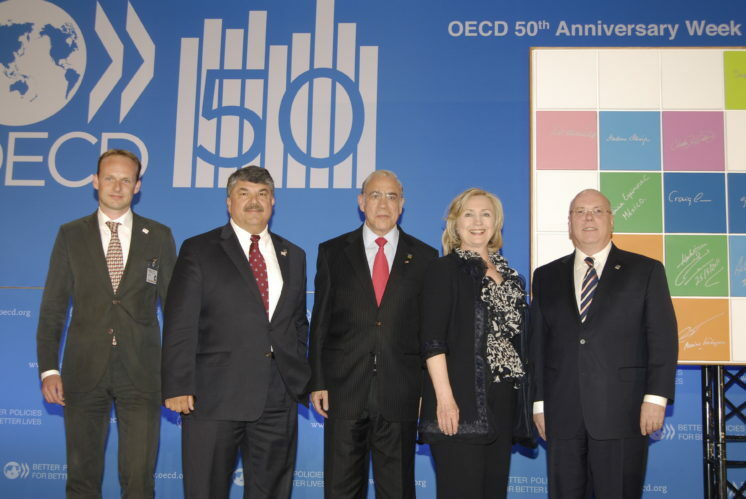 Photo: Representatives of OECD Watch, TUAC, and BIAC join OECD Secretary-General Angel Gurría (centre) and U.S. Secretary of State​ Hillary Clinton during the 2011 revision of the Guidelines. The Trade Union Advisory Committee (TUAC) and Business at OECD (BIAC) are designated as “advisory bodies” to the Investment Committee. OECD Watch and the advisory bodies together form part of the official institutional set-up of the OECD Guidelines. OECD Watch and the advisory bodies represent the interests of their respective constituencies at the OECD, attending regular stakeholder consultations and providing other inputs to the OECD, National Contact Points (NCPs), or member and adherent governments. Under the OECD Guidelines’ Procedural Guidance, TUAC, BIAC and OECD Watch have the right to request that the Investment Committee issue a clarification of a particular clause or term in the OECD Guidelines if there is a dispute about the applicability of the Guidelines. TUAC, BIAC and OECD Watch also have the right to file a formal, substantiated complaint against an NCP if they feel the NCP has not followed the Procedural Guidance correctly. Business at OECD (BIAC) is an independent international business association devoted to advising government policymakers at the OECD and related fora on the many diversified issues of globalisation and the world economy. Officially recognised since its founding in 1962 as the representative of the OECD business community, BIAC promotes the interests of business by engaging, understanding, and advising policy makers on a broad range of issues with the overarching objectives of positively influencing the direction of OECD policy initiatives; ensuring business and industry needs are adequately addressed in OECD policy decision instruments that influence national legislation; and providing members with timely information on OECD policies and their implications for business and industry. The Trade Union Advisory Committee (TUAC) to the OECD is an interface for trade unions with the OECD. It is an international trade union organisation with consultative status with the OECD and its various committees.TUAC’s origins go back to 1948 when it was founded as a trade union advisory committee for the European Recovery Programme – the Marshall Plan. TUAC’s current role is to help ensure that global markets are balanced by an effective social dimension. Through regular consultations with various OECD committees, the secretariat, and member governments, TUAC coordinates and represents the views of the trade union movement in the industrialized countries. TUAC works closely with other international trade unions, including the International Trade Union Confederation (ITUC), with which it co-ordinates trade union inputs to the G20 (through the Labour 20) and G7 processes, and the European Trade Union Confederation (ETUC). On sector specific issues TUAC works with the Global Union Federations (GUFs) and is a member of the Council of Global Unions. OECD Watch is a global network of civil society organisations with more than 130 members in 55 countries. We are made up of a diverse range of organisations – from human rights to environmental and development organisations, from grassroots groups to large, international NGOs. We are bound together by our commitment to ensure that business activity contributes to sustainable development and poverty eradication; that corporations are held accountable for their actions around the globe; that governments fulfil their duty to protect human rights; and that the victims of business-related abuse receive remedy. OECD Watch’s key aim is to inform and advise the wider NGO community on how to make use of the OECD Guidelines for Multinational Enterprises (“the Guidelines”) and its associated grievance mechanism to achieve corporate accountability and access to remedy. OECD Watch also monitors and advocates for improved NCP performance and implementation of the Guidelines, and develops policy advice on a wide range of social, environmental, and economic topics relevant to responsible business activity.